Just one hailstorm could likely have the potential to aggravate you thousands of dollars from dealing damages to your unprotected vehicle. Now, one of the essential things that you should keep in mind is if your car insurance is still intact. If not, it’s a good thing that an auto hail repair in Denver, Colorado is more than willing to save you some of the hassle and stress. Colorado is considered as hail heaven for its geography’s high altitude and dry air. It is a great location to form icy stones and for strong, dry winds to carry water up and up to the higher, colder parts of the atmosphere and hold them there. The Colorado hail season is between the months of April and September. Getting prepped to protect our beloved automobiles from damaging hailstorms are one of the biggest concerns in the area on those times of the year. According to the Rocky Mountain Insurance Information Association, in a typical season, Colorado sees about three or four catastrophic hailstorms. Just imagine what methods you should do to protect your vehicles three to four times every year from the hail that’s coming! It’s like you are Jon Snow of Game of Thrones battling with the Night King during Winter. Fortunately, if the hail-tastrophe has victimized you, Paintless Dent Repair Service has come to town. Hail the Hail Damage Experts! If a hailstorm has dinged and dented your car, there’s no need to feel upset and frustrated. Your one-stop auto hail repair shop is now in Denver. There is a method to be used to remove dents and dings from the body of the car. This method is the Paintless Dent Removal (PDR). Each PDR technician has undergone extensive training and requires years of personal experience to master this process. Why undergo PDR as your Auto Hail Repair? Tiptop is an auto hail dent repair company. It works with car owners and automobile body shops in the Denver, Colorado. If it happens that your car gets trapped into the hail-tastrophe, need not to worry. Just bring at Tip Top Auto Hail and they surely are experts at fixing hail damage. They use innovative, paintless dent repair technology that can restore automobile damage quickly and efficiently. You will surely be amazed at the results of their work. Moreover, they work directly with all insurance companies to make the process as easy on their clients as possible. Some car owners dwell on watching Do-It-Yourself (DIY) videos to remove their dents. However, most DIY videos don’t tell you that amateur work on dent removal can make the problem worse. It takes the right amount of pressure to the metal for the dent to be restored and fixed to its factory finish. 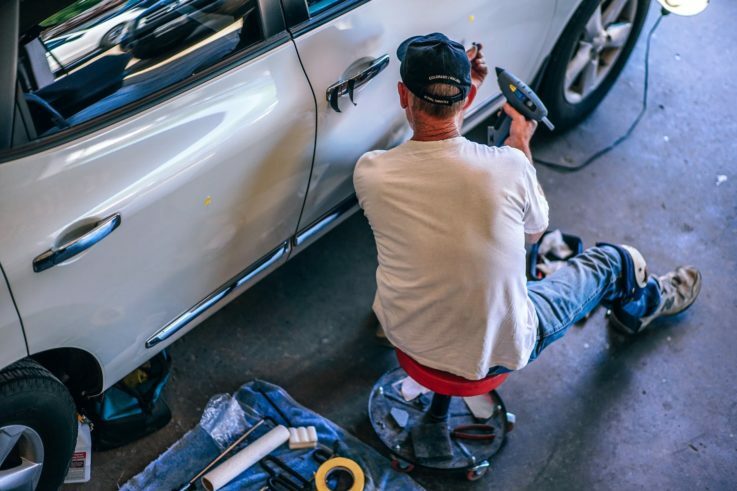 This is the reason why Tip Top dent technicians provide clients with information on how the service is done to show you why it is best to let them handle the job. But wait, there’s more! They also offer repair services on door dings, dinner plate dent sizes, minor scratch repairs, buffing and polishing of your automobiles! If you are looking for someone to go above and beyond for every hail car dent, come in for a free estimate. Let Tip Top Auto Hail remove your auto’s dent—may be big or small, quickly and efficiently. You can call them at 303-868-1270.